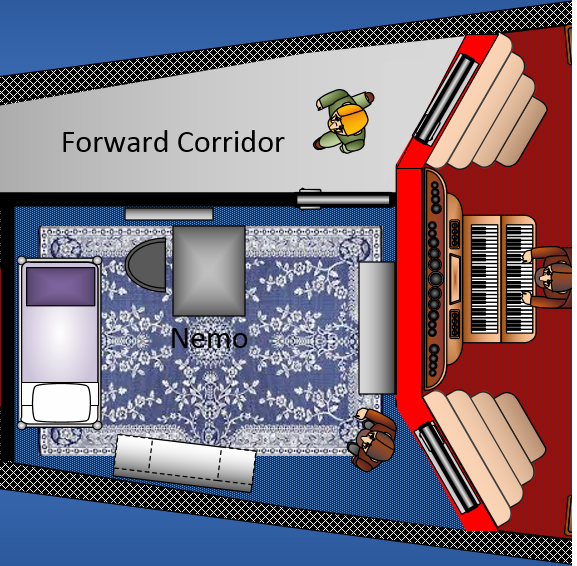 There seems to be some question about the number of doors to Nemo’s cabin; one from the Forward Corridor and one from Aronnax’s room. From my examination and evaluation, the true dimensions of the boat make the Aronnax cabin far too small to have a second door taking up wall space when one will suffice. I allowed only the one to the starboard Forward Corridor. Ch 14: “…When Ned Land and Conseil appeared at the door of the Salon…” There was only one Salon door leading aft into the Library. The double doors were between the Library and the Dining Room. There was also some debate if the boats corridors were inboard, and/or outboard. Jean-Pierre Bouvet feels strongly that they were outboard, with all the compartments amidships. There seems to be evidence both for this, and against it. I elected to stay with the central corridor concept for efficiency, simplicity and function, per the technology and engineering of the 19th century. Plus we still use the central passageway and two deck levels on submarines today. I added a couple of rolling Library ladders much, used then as now, to allow access to book over the sofas. This was not mentioned by Verne, but his description of the couches and the original art left an issue of reaching all those books above them. Verne said a door opened from the Salon into a forward passageway and thereby into Aronnax’s cabin and Nemo’s. This is on a corridor that could not have been amidships, but had to be on the port or starboard side. This is how I drew it and elected to place it on the starboard side. The Verne narrative states there were control gauges in the Salon and Nemo’s cabin. I made the presumption, as did Jean-Pierre Bouvet, that a set were also installed in the Wheelhouse. I also added a set in the Chart Room to make them handy to Nemo and/or the First Mate who might need them while reviewing charts. I verified that the stated “30” pieces of wall art in various sizes would fit on the Salon walls. 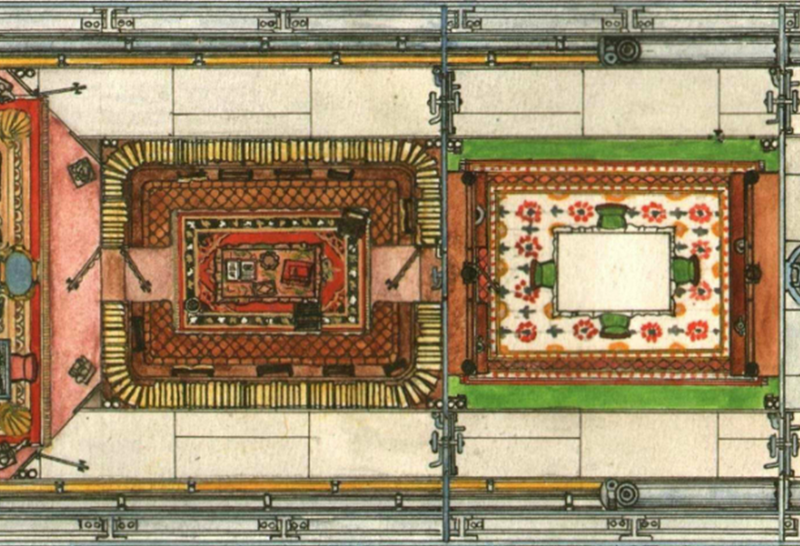 I even placed them above the entry and exit doors, their raised/angled wall space, windows, organ, corner statues, vents above doors and above display cases height line. Ch 8: Aronnax, “Wandering through the Salon, I came to the door, set into one of the canted corners, that led into the captain’s cabin… Still the same stark, monastic look.” The art pieces here were portraits of Nemo’s heroes.